Have you ever noticed a flock of birds sitting on a telephone wire and wondered what their conversation was about? I imagine from that height they get a pretty good view of what’s going on in the neighborhood. Actually, when I saw a picture on Pinterest of birds sitting on a line, the first thing I thought was that it would be a good lesson on perspective. 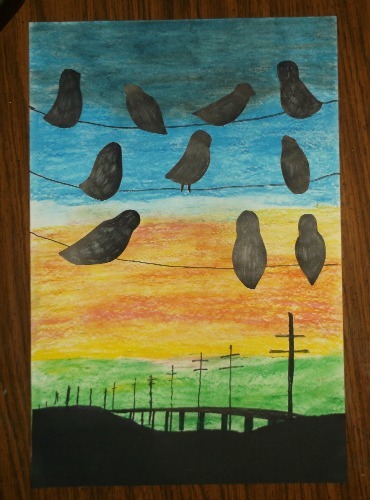 This project was inspired by the, “Birds on Lines,” art of Patty Baker. You’ll find this project called, “Party Lines” in the 6th Grade Projects Gallery in the sidebar. Other classes could also do this project. This entry was posted in Categories and tagged 6th grade, art, art class, art projects for kids, birds on lines, classroom, colored chalk, kids and glitter, oil pastels, party lines, perspective, perspective art, project. Bookmark the permalink.